Panasonic has announced two new additions to its Lumix digital camera line that should—just barely—arrive in time for the end-of-year gift-giving season. The Lumix 3D1 is a dual-lens compact camera that can either capture 3D images or shoot video and stills simultaneously, while the larger Lumix GX1 adds features designs for more serious photographers, along with excellent low-light response. First up, the Lumix 3D1 features a twin-lens, dual-system design that enables the camera to capture 8 megapixel 3D images or 12 megapixel 2D still images—and, just to top things off, it can shoot both video and still images simultaneously. Users can capture high-def 1080p/60i video with one lens and shoot 12-megapixel still with the other without interrupting video recording—the example Panasonic gives is shooting video of a party, then zooming to capture a photo of a specific person with the other lens. The Lumix 3D1 sports a 4× optical zoom. 3.5-inch touchscreen, and a fast shooting mode that can capture 4 fps with autofocus (8 without!) for capturing action. There’s also Panasonic’s Intelligent Auto mode (including intelligent scene selection, face recognition, ISO control, and a night mode that layers consecutive images so users can capture night shots without a tripod. 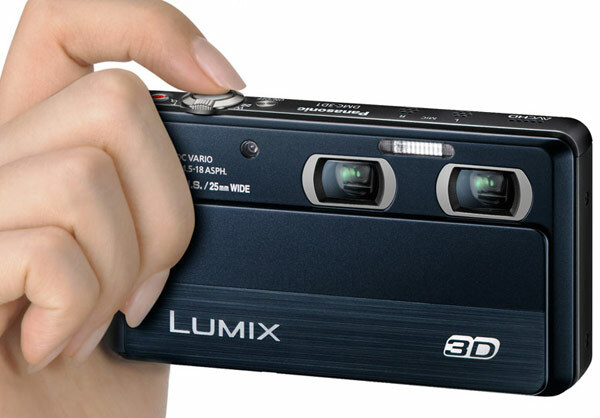 Panasonic says the Lumix 3D1 will be available in December for a suggested price of $499.99. Next up, the Panasonic Lumix GX1 aims at photography enthusiasts: it supports Micro Four Thirds interchangeable lenses (so users can switch from standard lenses to superzooms to fisheyes to anything they like), along with a 16 megapixel resolution, 3-inch touchscreen, revamped ergonomics, and a simplified operation that users can customize to their needs. The Lumix GX1 also sports a level indicator (so users can tell how much the camera is tilted, and a fast contrast-based autofocus that can use the full sensor area: Panasonic says the Lumix GX1 autofocus is about 90 percent accurate at ƒ1.4 compared to about 60 percent with standard phase-difference autofocus. The GX1 can also short 1080p/60i high-definition video (where the autofocus and touch autofocus features can be very useful); the camera also sports a supersonic dust reduction system and Panasonic’s Intelligent Auto and Intelligent Auto Plus modes fo help beginners use the camera. 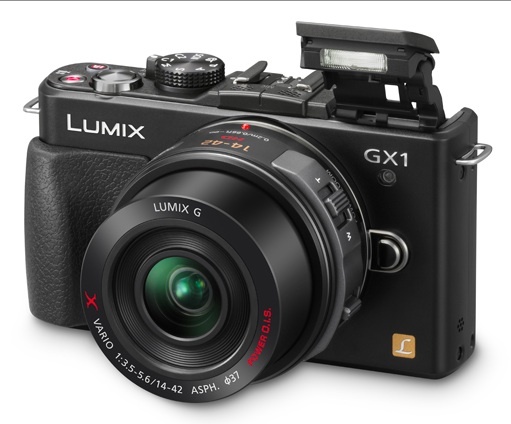 Panasonic says the Lumix GX1 will be available in mid-December in a variety of kit options: a body-only version (no lenses) will start at a suggested price of $699.99.